"Ayeyarwady" redirects here. For the administrative division, see Ayeyarwady Region. The native Kachin people named the river Mali-Nmai-Hka. The Burmese name of Irrawaddy is derived from a Pali name for the Ravi River of India, Irāvatī. Airavati (Pali Erāvatī) was the Pali version of the name of the elephant mount of Sakka, and Indra in Hinduism. Saka is an important deva in Buddhism. Elephants were often a symbol for water and was used as the name for several others rivers, such as the Achiravati. The Irrawaddy gives its name to the Irrawaddy dolphin (Orcaella brevirostris), which is found in the lower reaches of the river and known to help fishermen who practice cast-net fishing. Though called Irrawaddy dolphin, it has been also found in the Bay of Bengal and the Indian ocean. The Irrawaddy River bisects Myanmar from north to south and empties through the nine-armed Irrawaddy Delta into the Indian Ocean. The Irrawaddy River arises by the confluence of the N'mai (Nam Gio) and Mali Rivers in Kachin State. Both the N'mai and Mali Rivers find their sources in the Himalayan glaciers of Upper Burma near 28° N. The eastern branch of the two, N'mai, is the larger and rises in the Languela Glacier north of Putao. It is unnavigable because of the strong current whereas the smaller western branch, the Mali river, is navigable, despite a few rapids. Herefore, the Mali river is still called by the same name as the main river by locals. The controversial Myitsone Dam is currently under construction at the convergence of these rivers. The town of Bhamo, about 240 kilometres (150 mi) south of the Mali and N'mai river confluence, is the northernmost city reachable by boat all the year round although during the monsoons most of the river cannot be used by boats. The city of Myitkyina lies 50 kilometres (31 mi) south of the confluence and can be reached during the dry season. About 65 kilometres (40 mi) downstream from Myitkyinā is the first defile. Below Bhamo the river makes a sharp westward swing, leaving the Bhamo alluvial basin to cut through the limestone rocks of the second defile. This defile is about 90 metres (300 ft) wide at its narrowest and is flanked by vertical cliffs about 60 to 90 metres (200–300 ft) high. About 100 kilometres (62 mi) north of Mandalay, at Mogok, the river enters the third defile. Between Katha and Mandalay, the course of the river is remarkably straight, flowing almost due south, except near Kabwet, where a sheet of lava has caused the river to bend sharply westward. This sheet of lava is the Singu Plateau, a volcanic field from the Holocene. This field consists of magma from the fissure vents and covers an area of about 62 square kilometres (24 sq mi). The plateau is also known as Letha Taung. Leaving this plateau at Kyaukmyaung, the river follows a broad, open course through the central dry zone – the ancient cultural heartland – where large areas consist of alluvial flats. From Mandalay (the former capital of the kingdom of Myanmar), the river makes an abrupt westward turn before curving southwest to unite with the Chindwin River, after which it continues in a southwestern direction. 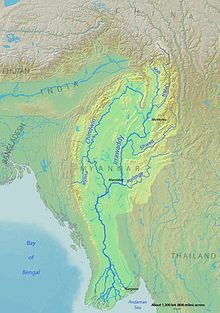 It is probable that the upper Irrawaddy originally flowed south from Mandalay, discharging its water through the present Sittaung River to the Gulf of Martaban, and that its present westward course is geologically recent. Below its confluence with the Chindwin, the Irrawaddy continues to meander through the petroleum producing city of Yenangyaung, below which it flows generally southward. In its lower course, between Minbu and Pyay, it flows through a narrow valley between forest-covered mountain ranges—the ridge of the Arakan Mountains to the west and that of the Pegu Yoma Mountains to the east. The delta of the Irrawaddy begins about 93 kilometres (58 mi) above Hinthada (Henzada) and about 290 kilometres (180 mi) from its curved base, which faces the Andaman Sea. The westernmost distributary of the delta is the Pathein (Bassein) River, while the easternmost stream is the Yangon River, on the left bank of which stands Myanmar's former capital city, Yangon (Rangoon). Because the Yangon River is only a minor channel, the flow of water is insufficient to prevent Yangon Harbour from silting up, and dredging is necessary. The relief of the delta's landscape is low but not flat. The soils consist of fine silt, which is replenished continuously by fertile alluvium carried downstream by the river. As a result of heavy rainfall varying from 2,000 to 3,000 millimetres (79–118 in) a year in the delta, and the motion and sediment load of the river, the delta surface extends into the Andaman Sea at a rate of about 50 metres (160 ft) per year. Due to monsoonal rains, which occur between mid-May and mid-October, the volume of the Irrawaddy and its tributaries varies greatly throughout the year. In summer, the melting of the snow and glaciers in Northern Burma add to the volume. The average discharge near the head of the delta is between a high of 32,600 cubic metres (1,150,000 cu ft) and a low of 2,300 cubic metres (81,000 cu ft) per second. The discharge can be as high as 40,393 cubic meter per second in rainy season. Over a year, the discharge averages 13,000 cubic metres (460,000 cu ft). Further North, at Sagaing, the hydrograph shows a 38% decrease in discharge compared to where the river enters the delta. it also silted up around 278 tons of sand every year. Variation between high and low waterlevel is also great. At Mandalay and Prome, a range of 9.66 to 11.37 metres (31.7–37.3 ft) has been measured between low-water level and floodlevel respectively. Because of the monsoonal character of the rain, the highest point is recorded in August, the lowest in February. This variation in water level makes it necessary for ports along the river to have separate landing ports for low- and high-water. Still, low water levels have caused problems for ports along the river, as in the Bamaw–Mandalay–Pyay sectors, the shallowest point is as shallow as 60 centimetres (2.0 ft). Within the basin, the average population density is 79 people/km2. For these people, the river supply amounts to 18,614 m3 per person per year. The spot-billed pelican was once widespread in Asia, but is not known to breed in Burma anymore. 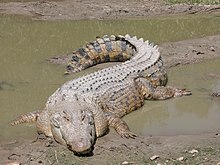 Although the saltwater crocodile is not common in Burma, they do live in and near reserved forests. Attacks on people still occur in the Irrawaddy river. No complete and precise list of all the fish in the Irrawaddy river basin currently exists, but in 1996 it was estimated that there are about 200 species. In 2008, it was estimated that the Irrawaddy ecoregion is home to 119–195 species of fish found nowhere else in the world (endemic). Several new species of fish have been described from the Irrawaddy river basin in recent years (for example, the cyprinid Danio htamanthinus in 2016 and the stone loach Malihkaia aligera in 2017), and it is likely that undescribed species remain. Among the most well-known species in the river is the Irrawaddy dolphin (Orcaella brevirostris), a euryhaline species of oceanic dolphin with a high and rounded forehead, lacking a beak. It is found in discontinuous sub-populations near sea coasts and in estuaries and rivers in parts of the Bay of Bengal and South-East Asia. Along the North-South course of the Irrawaddy River, a number of notably different ecoregions can be distinguished. The streams of the Nmai and Mali that form the Irrawaddy originate in high and remote mountains near the border with Tibet. This part of Burma, which extends north from Myitkyina and the Irrawaddy confluence, lies entirely outside the tropics. Rain falls at all seasons of the year, but mostly in the summer. The valleys and lower hill ranges are covered with tropical and subtropical evergreen rainforest instead of monsoon (deciduous) forest. This region is characterised by subtropical and temperate forests of oak and pine are found at elevations above 900 metres (3,000 ft). This evergreen forest passes into sub-tropical pine forest at about 1,500 metres (4,900 ft) feet. Above 1,800 metres (5,900 ft), are forests of rhododendrons, and that in turn into evergreen conifer forest above 2,400 metres (7,900 ft) feet. The Irrawaddy river basin covers an approximate area of 255 81 km2 (31 sq mi). The Central Basin consists of the valley of the middle Irrawaddy and lower Chindwin. It lies within the 'dry zone' and consists almost entirely of plains covered with the teak-dominated Irrawaddy Moist Deciduous Forest ecoregion surrounding drier patches of dry forests. The central basin receives little rain (ave 650mm per year) although it does flood quickly during the July–October storms. The one meteorological factor which does not vary greatly, and which is the most important for plant life, is atmospheric humidity. This is always high, except in the winter in certain localities. Humidity usually does not fall below 75% and is 90% or more for long periods during summer. Another feature is the prevalent southerly summer winds which erode the soil of the basin. The natural habitats of this central zone have been much altered for farming and there are few protected areas. The predominant trees of the drier patches are the thorny Terminalia oliveri and the hardwood dahat teak (Tectona hamiltoniana) with stands of Indaing Dipterocarpus tuberculatus which is cut for timber. The wildlife includes many birds, small mammals and reptiles such as the huge Burmese python. However, most of the large animals including the tiger have been hunted out or seen their habitats disappear. The Irrawaddy River and its tributaries flow into the Andaman Sea through the Irrawaddy Delta. This ecoregion consists of mangroves and freshwater swamp forests. It is an extremely fertile area because of the river-borne silt deposited in the delta. The upper and central portions of the delta are almost entirely under cultivation, principally for rice. 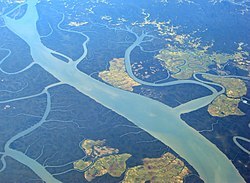 The southern portion of the ecoregion transitions into the Burmese Coast mangroves and is made up of fanlike marshes with oxbow lakes, islands, and meandering streams. Birds of the delta are both winter visitors and passage migrants including great cormorant (Phalacrocorax carbo), a wide variety of Anatidae, Eurasian coot (Fulica atra), about thirty species of migratory shorebirds, the whiskered tern (Chlidonias hybrida), the Caspian tern (Hydroprogne caspia), and the brown-headed gull (Larus brunnicephalus), which is very common. One of the most numerous wintering shorebird is the lesser sand plover (Charadrius mongolus), which occurs in flocks of many thousands along the outer coast of the delta. The wood sandpiper (Tringa glareola) and red junglefowl (Gallus gallus) are also abundant. In the late 19th century, the spot-billed pelican (Pelecanus philippensis) nested in huge numbers in south Burma. One colony on the Sittaung River plain to the east of the delta was described in November 1877 as covering 300 square kilometres (100 sq mi) and containing millions of birds. Immense colonies still bred in the area in 1910, but the birds had disappeared completely by 1939. Small numbers were regularly reported in the delta in the 1940s, but no breeding sites were located. As of 2010[update], no pelicans have been recorded, and it may well be that the species is now extinct in Burma. Several species of large mammal occur in the delta, but their populations are small and scattered, with the possible exceptions of the Malayan sambar deer (Cervus unicolor equinus), Indian hog deer (C. porcinus), and wild boar (Sus scrofa), which have been reported from all Reserved Forests. Asian elephants (Elephas maximus) were once widespread throughout the country with numbers as high as 10,000 animals, but in the last decade[update] numbers have dwindled, partly due to transferring the animals to logging camps. Other species reported to be present include the leopard, Bengal tiger, crab-eating macaque, wild dog, and otters (Panthera pardus, P. tigris, Cuon alpinus, and Lutra species). The saltwater crocodile (Crocodylus porosus) can be found in the southern part of the delta. The species was formerly abundant in coastal regions, but population numbers have decreased because of a combination of commercial skin hunting, habitat loss, drowning in fishing nets and over-collection of living animals to supply crocodile farms. It was at this river that a battle between a saltwater crocodile and a tiger was observed that ended with the reptile devouring the tiger. Despite recent declines in the sea turtle populations, five species are known to nest in Burma at well known island and mainland beaches known as turtle-banks. These are the olive ridley sea turtle (Lepidochelys olivacea), the loggerhead sea turtle (Caretta caretta), the green sea turtle (Chelonia mydas), the hawksbill sea turtle (Eretmochelys imbricata), and the leatherback sea turtle (Dermochelys coriacea). Pulling teak logs, made into large rafts and floated down the Irrawaddy River, ashore near Mandalay. As early as the sixth century, ancestors of the Burmese were using the Irrawaddy river, which runs through the center of Burma, to gain power in the region through trade and transport on the China – India route. By the twelfth century, a well-developed network of canals made for flourishing rice cultivation. Later, the river became a key economic tool of Imperial British interests, who set up trading ports along its shores. Today, the Irrawaddy is still the country's most important commercial waterway. Despite Mandalay's position as the chief rail and highway focus in northern Burma, a considerable amount of passenger and goods traffic moves by river. As the Irrawaddy Delta is one of the world's major rice-growing areas, one of the most important goods transported is rice. Teak logs – Myanmar is one of the world's top exporters – are floated down the river as large rafts. Before it is transported, teak has to be seasoned, because otherwise it won't float. This happens by girdling, a practice where a deep circular cut through bark and sap is made into the heartwood. Other major goods that are transported from the nation's heartlands to Yangon for export are other foodstuffs, petroleum, cotton, and local commodities. Commercial transportation on the Irrawaddy is maintained for about 1,300 kilometres (810 mi): from Hinthada to Bhamo (1,080 kilometres (670 mi)) throughout the year, but from Bhamo to Myitkyina (200 km) for only seven months. More than 3,200 kilometres (2,000 mi) of navigable waterways exist in the Irrawaddy delta, and there is a system of connecting canals. The Sittang is usable by smaller boats, but the Salween River, because of its rapids, is navigable for less than 160 kilometres (99 mi) from the sea. Small steamers and country boats also serve the coasts of the Rakhine State and Tanintharyi Region. On the Chindwin River, transportation is carried on by steam or diesel vessels throughout the year up to Homalin—about 640 km from its confluence with the Irrawaddy. Seasonal navigation is carried on into Tamanthi, which is 57 miles (92 km) by river above Homalin. The Chindwin valley has no railroad and relies heavily on river transport. Chauk, downstream from the confluence in the oil-field district, is a petroleum port. It is linked to Yangon by road and rail. Hinthada, near the apex of the delta, is the rail junction for lines leading to Kyangin and Bassein (Pathein). A ferry operates between Hinthada on the west bank and the railway station at Tharrawaw on the east bank. The power generated by the dams will be transmitted to other countries in the South-East Asian region, with most going to China. Other countries targeted for power export are Thailand, India and Bangladesh. Chinese involvement comes from China Power Investment Corporation, China Southern Power Grid, Yunnan Machinery Equipment Import & Export Company Changjiang Institute of Surveying, Planning, Design and Research. At least one Japanese company is involved, Kansai Electric Power Company. Due to its location and size, construction of the Myitsone Dam has raised significant ecological and sociological concerns. According to the Irrawaddy Myitsone Dam Multipurpose Water Utilizing Project study, the maximum water level of the reservoir will be 290 metres. This makes for a flood zone of 766 km2, compromising 47 villages. Other consequences of the inundation include loss of farmland, loss of spawning habitat as fishes can not swim upstream anymore. The Kachin Development Networking Group, a network of civil society groups and development organisations in Kachin State warn this will lead to a loss of income for fishermen. They report locals are also worried about the flooding of cultural sites in the flood zone. As with other large dam projects, the Myitsone Dam construction will alter the hydrological characteristics of the river, e.g. preventing sediment from enriching riverbanks downstream, where it usually enriches the riverside foodproducing plains. This can affect fertility as far downstream as the Irrawaddy Delta, the major rice-producing area of Myanmar. Ecological concerns focus on the inundation of an area that is the border of the Indo-Burma and South Central China biodiversity hotspots. The Mali and N'mai River confluence region falls within the Mizoram-Manipur-Kachin rainforests, added to the WWF list of outstanding examples of biodiverse regions. The location of the Myitsone Dam, located less than 100 km from a fault line where the Eurasian and Indian tectonic plates meet, raised concerns about its earthquake resistance. Earthquakes in the region, such as the 5.3 magnitude earthquake that struck near the Burma-China border on 20 August 2008, prompted Naw Lar, the coordinator of the KDNG dam research project, to ask the junta to reconsider its dam projects. The Ava Bridge near Sagaing, rebuilt in 1954 after the wartime destruction of the original bridge built in 1934, was the only bridge over the Irrawaddy until 1998. Until the construction of the Ava (Innwa) Bridge, a 16 span rail and road cantilever bridge built by the British colonial government in 1934, the only way across the Irrawaddy was by ferry. The bridge was destroyed by the retreating British Army during World War II and was rebuilt in 1954 after Burmese independence and was the only bridge to span the Irrawaddy until recent times when a spate of bridge construction has been carried out by the government. Scott, James George (1911). "Irrawaddy" . In Chisholm, Hugh (ed.). Encyclopædia Britannica. 14 (11th ed.). Cambridge University Press. p. 839. ^ "Irrawaddy etymology". myanmar.gov.mm. Archived from the original on 17 February 2010. Retrieved 17 January 2017. ^ Brian D Smith; et al. (December 1997). Asian Marine Biology 1997:Investigation of Cetaceans in the Ayeyarwady River and Northern Coastal Waters of Myanmar. Hong Kong University Press. p. 173. ISBN 978-962-209-462-8. Archived from the original on 11 January 2016. Retrieved 6 October 2008. ^ Tint Tun. "Irrawaddy Dolphin". Archived from the original on 25 July 2008. Retrieved 6 October 2008. ^ Document about the floradiversity in Northern Kachin, in the N'mai watershed Archived 19 December 2008 at the Wayback Machine. Studies on Floradiversity of North-eastern Kachin Myanmar Section of Sino-himalaya (N'mai Hka-Than Lwin Water Division) – Ma Kalayar Lu, Myitkyina University, faculty of Botanics, 28-8-06. retrieved 6-12-2008. ^ Global Volcanism Program Archived 14 May 2013 at the Wayback Machine – vulcanologic ranking. ^ "Google Maps". google.nl. Archived from the original on 18 January 2017. Retrieved 17 January 2017. ^ Thomas Streissguth, Myanmar in pictures Archived 11 January 2016 at the Wayback Machine, Twenty-First Century Books, 2007. ISBN 0-8225-7146-3. Retrieved 16-12. ^ Article about the Bago Mountains on Encyclopædia Britannica Online. ^ Map on the rainfall in Myanmar Archived 20 November 2008 at the Wayback Machine retrieved 17-12-2008. ^ Encyclopædia Britannica Online Archived 28 April 2015 at the Wayback Machine Physiography, alinea 4. Retrieved 17-12-2008. ^ a b "Irrawaddy River – hydrology". Encyclopædia Britannica. 17 July 2009. Archived from the original on 28 April 2015. ^ "Shallow Irrawaddy". Today in Myanmar. 25 February 2009. Archived from the original on 7 March 2009. Retrieved 18 July 2009. ^ "MSN | Outlook, Office, Skype, Bing, Breaking News, and Latest Videos". Archived from the original on 2 November 2012. Retrieved 18 August 2010. ^ Kottelat, M. (2017). "A new genus and three new species of nemacheilid loaches from northern Irrawaddy drainage, Myanmar (Teleostei: Cypriniformes)". Raffles Bulletin of Zoology. 65: 80–99. ^ L. Dudley Stamp (May 1940). "The Irrawaddy River". The Geographical Journal. 95 (5): 329–352. doi:10.2307/1787471. JSTOR 1787471. ^ "Myanmar Coast mangroves". Terrestrial Ecoregions. World Wildlife Fund. Retrieved 17 August 2009. ^ "Irrawaddy Swamp Forests". Terrestrial Ecoregions. World Wildlife Fund. Retrieved 17 August 2009. ^ Irrawaddy Delta Fauna Archived 15 May 2008 at the Wayback Machine, Asian Regional Centre for Biodiversity Conservation, retrieved 8 August 2009. ^ A population survey of the estuarine crocodile in the Ayeyarwady Delta, Oryx Volume 34 Issue 4, Pages 317 – 324. Retrieved 8 August 2009. ^ Dalton, William (2010). The White Elephant: Or, the Hunters of Ava and the King of the Golden Foot. Nabu Press. p. 239. ISBN 978-1-148-55210-1. ^ "Sea Turtles in Myanmar: Past and Present, Marine Turtle Newsletter 88:10–11". www.seaturtle.org/. Retrieved 8 August 2009. ^ Burma: Sahibs in the Shan States Archived 28 August 2009 at the Wayback Machine, The Politics of Heroin in Southeast Asia (1972), Alfred W. McCoy with Cathleen B. Read and Leonard P. Adams II. Chapter 3 "The Colonial Legacy", paragraph "Burma: Sahibs in the Shan States. Retrieved 2 August 2009. ^ Irrawaddy River Archived 28 April 2015 at the Wayback Machine (2009). In Encyclopædia Britannica. Retrieved 6 August 2009, from Encyclopædia Britannica. Brandis, Dietrich; Gamble, James Sykes (1911). "Teak" . In Chisholm, Hugh (ed.). Encyclopædia Britannica. 26 (11th ed.). Cambridge University Press. p. 485. ^ Saviours Sought To Halt Irrawaddy River Dam Project Archived 29 December 2016 at the Wayback Machine (14 March 2009) Nawdin Lahpai on Kachin News Archived 24 February 2017 at the Wayback Machine. Retrieved 17 September 2009. ^ "Irrawaddy Myitsone Dam". Archived from the original on 23 February 2012. Retrieved 4 February 2010. ^ Tin Maung Maung Than. (2005). Myanmar's Energy Sector: Banking on Natural Gas Myanmar's Energy Sector: Banking on Natural Gas In Chin Kin Wah & Daljit Singh (Eds. ), Southeast Asian Affairs 2005 (pp. 257–289). Singapore: Institute of Southeast Asian Studies. ^ "Mizoram-Manipur-Kachin rain forests". Terrestrial Ecoregions. World Wildlife Fund. Retrieved 22 September 2009. ^ Earthquake Raises Concern over Mega Dams Archived 27 July 2011 at the Wayback Machine, 20 August 2009. Retrieved 24 September 2009. ^ "Roads and Bridges". Union Solidarity and Development Association. 7 April 2006. Archived from the original on 23 June 2008. Retrieved 6 October 2008. ^ "myanmargeneva.org" (PDF). Archived (PDF) from the original on 29 December 2016. Retrieved 17 January 2017. ^ "Sr General Than Shwe attends opening of Anawrahta Bridge linking Chauk and Seikphyu on Ayeyawady River". The New Light of Myanmar. 5 April 2001. Archived from the original on 27 April 2011. Retrieved 6 October 2008. ^ "Minbu Bridge (Magway Region) - Structurae". structurae.net. Retrieved 17 January 2017.